Elaine has moved to University College Dublin (UCD) as Associate Professor in Chemical Biology. Most of the current research group will stay in Nottingham to complete their PhD studies and research projects and new students will join the group at UCD. Well done to Andrew for winning the award for best talk at the 2017 ESSF Conference. Elaine is delighted to received the 2017 RSC Harrison-Meldola Memorial Prize for the 'development of methodology that expands and simplifies biocatalytic amine synthesis '. Take a look at the link to the award for more information. Hello everyone, my name is Andrew and I am a second-year PhD student based here in the O’Reilly research group. Recently I was given the great opportunity to attend a conference in Lucknow India and then to spend a week visiting an Indian University, IIT Bombay. I thought I’d just share some of my experiences with you. The conference I attended is called J-NOST and is the junior version of a conference called NOST (National Organic Symposium Trust). This meeting was established in 1983 by a group of distinguished Indian academics who wanted to share Indian organic chemical research with other researchers from across the globe. Following its success, J-NOST was formed in 2003, allowing PhD students to come together and share their work. Since its inception, each year the Royal Society of Chemistry has funded several UK based students to go and present their work, luckily for me this year I was one of those selected to go! The conference was hosted in the Central Drug Research Institute (CDRI) in Lucknow. 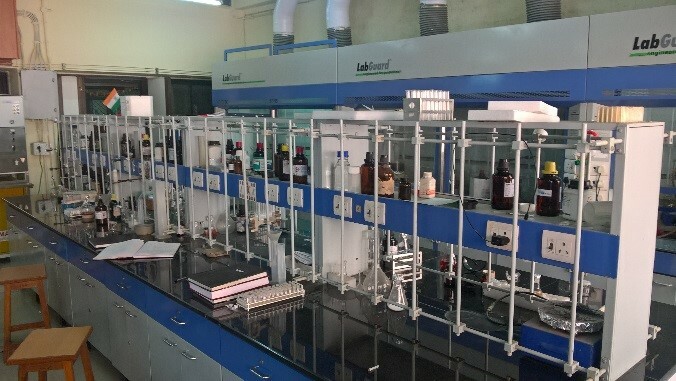 This facility tries to find chemicals that show promising activity towards diseases that are not commonly researched in the west. The institute was huge and was well equipped with analytical equipment, boasting several NMR machines and X-ray crystal facilities. I was particularly impressed by how much the different groups and disciplines seemed to talk with each other. It was clear that they were all working towards a common goal. Walking through the chemistry and biochemistry labs it became apparent that much of the equipment and layout of the labs were similar to our own. Where things started to differ was actually in the layout of the building. The entire facility was open-planned with most the walk ways open to the elements. The reason for this became apparent at mid-day when the temperature started to reach the mid-thirties, not bad for winter! In the summer the temperatures will rise to the mid-forties and it rains for much of the time. As well as developing chemical leads, the facility also did many of the biomedical tests in-house. 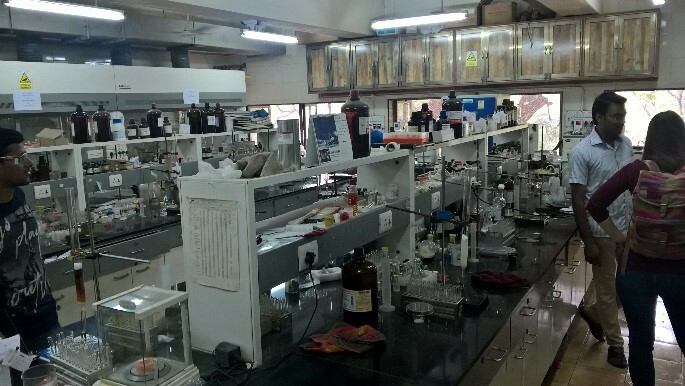 As such the facility housed many groups that focused on biochemistry and physiology. It also contained a large animal house where monkeys and gerbils where often used to see how affect the drug precursors where. We were lucky enough to be given a tour around their mosquito room… This room is where all the infected mosquitos are lovingly raised from nymph to adult and then let loose on the unfortunate gerbils. After being given a tour of the room everyone spent the next five minutes scratching at imaginary bites…. There were 70 research talks that took place over 3 days, which was quite intense. There were eight of us from the UK, along with five Germans with the rest coming from institutes from all over India. The talks were heavy on C-H activation and heterocyclic chemistry but I was proud to be flying the biocatalysis flag! During breaks in the talks we were treated to either a cup of incredibly sweet tea, or at lunch a selection of great curries. After the conference, myself and another student hopped on a plane and travelled 900 miles south to the Indian Institute of Technology Bombay in Mumbai. Here we had the chance to meet several different research groups and explore the University. 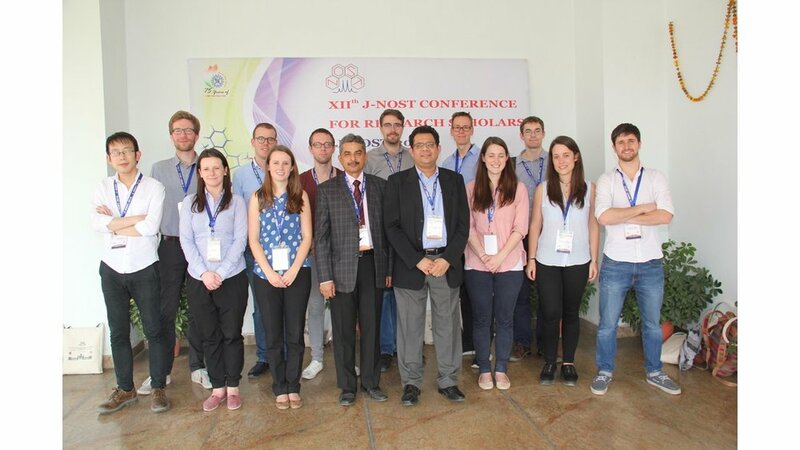 We were warmly received by the group of Professor Suvarn Kulkarni and received a crash course in the total synthesis of oligosaccharides. I found the group’s research to be of a very high standard and I found it surprisingly easy to become enthused about the wonders of beta-glycosylation! I was very impressed by the passion all the Indian students showed for their work. Group meetings were held from 7-9pm with many students then going back into the lab afterwards, something that I suspect definitely wouldn’t happen in the UK. Whilst visiting the Tata Institute for Fundamental Research we were told that each year the institute has 4000 applicants for just 10 PhD positions! At the IIT Universities, competition for PhD places is also fierce- with every prospective students having to sit a nationwide exam before they can even think about interviewing for a position. It was clear that all the students have to really want to do their studies, with a much greater barrier to entry than in the UK. Overall the trip was a fantastic experience, providing me with the chance to give an oral presentation at an international conference, in a PhD student friendly environment. It was great to meet organic chemistry PhD students from such different backgrounds and be able to happily discuss ideas and research. Visiting IIT Bombay was a fun and informative experience but also provided much food for thought. I would highly recommend any organic chemistry PhD students (who are comfortable with hot temperatures and curry) to give it a go! I’m very grateful to the RSC for funding and to Dr. Sanjay Batra for his organisation of JNOST-12 and to Drs Suvarn Kulkarni and Santosh Gharpure for their hospitality at IIT Mumbai. We are delighted to welcome the newest (most handsome) group member. Harry was born on September 4th 2016 and is already taking steps to familiarize himself with the Periodic Table! We are very pleased to welcome Christian to the group as an undergraduate summer project student. Originally from Germany, he started his undergraduate chemistry degree here at Nottingham in 2013 and is expected to finish in 2017. During his summer project, Christian will be working on a high-throughput solid phase assay to enable the detection of novel ω-Transaminase activity. His project is supported by BP. 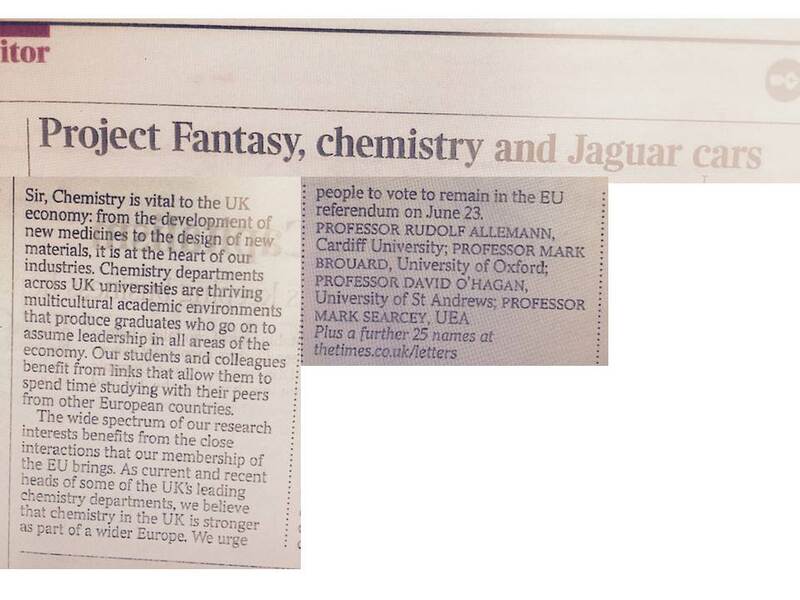 Our Head of School, Prof Jonathan Hirst, is one of 29 Department Heads who have signed a letter to the Times newspaper offering strong support to remain in the EU. A very warm welcome to Vera Salgado who has just joined our research group for a summer project. Vera's project is funded by the BBSRC IBCarb Network and will focus on the biocatalytic conversion of simple sugars to high-value chemicals. Well done to James who won first prize for his poster at the RSC 2016 North West Organic Regional Division Meeting. His poster showcased a novel transaminase-initiated aza-Michael cascade, which we hope to publish very soon. We are delighted to welcome Chris Peel to the group. Chris joined in May 2016 as part of the EPSRC CDT in Sustainable Chemistry. His PhD research will focus on the application of sustainable feed-stocks for the biocatalytic synthesis of high value products, exploiting enzymatic cascades. Big congratulations to Chris for sharing the joint award at the recent CDT 'Dragon's Den' event for best project presentation. In the spirit of sustainability, he will have a quarter acre of natural woodland dedicated to him!! The weekend was spent moving into our new temporary lab in chemistry. It has much more space and facilities and will be perfect for the next few weeks. In November, we will move into our brand new laboratory in Chemistry. Take a look at our 'gallery' to see some pictures of our current lab and of the new lab, which is still under construction. Good luck to Jay who leaves us for the University of Maryland where he plans to spend a year. Jay spent six weeks synthesising a panel of novel amine donors for application in transaminase-mediated biotransformations. We hope to publish this soon!